Leaf-cutting ants are fungus farmers. They cut leaves to make compost for a fungus they farm underground. A single leaf-cutter ant colony may have over five million individuals working together to farm fungus in their underground nest. 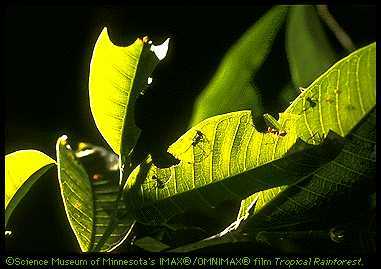 For more tropical rainforest resources, see the Science Museum of Minnesota's IMAX®/OMNIMAX® film - see the Tropical Rainforest cluster. How many ants live in a colony? What kinds of leaves do leaf-cutter ants eat? How big is a leaf-cutter ant? Why do ants seem to follow each other?